In December, Survation polled 1,011 young people between the ages of 14 and 17 on behalf of the Centre for Social Justice. The poll focused on young people’s attitudes toward relationships and marriage and found that a majority of young people have positive views of marriage and relationships. 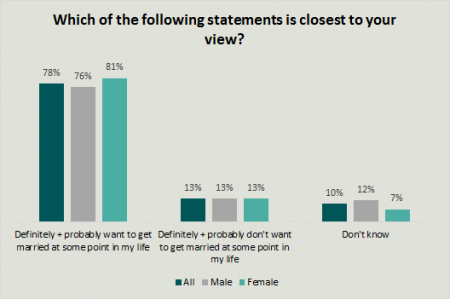 A majority of young people said they either definitely, 35%, or probably, 43%, want to get married at some point in their life. A total of 13% said they probably or definitely don’t want to get married, and 10% don’t know. About two thirds, 66%, of respondents said they think working life and having a long term relationship will be equally important when they are adults, while 17% said working life will be more important and 13% said a long term, lasting relationship will be more important. 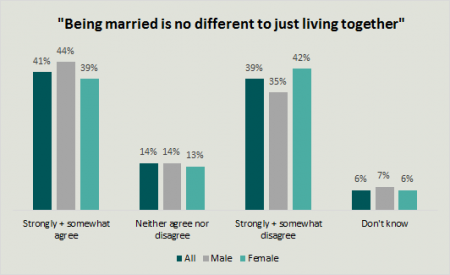 Respondents were split in their opinion on the statement “Being married is no different to just living together.” 41% strongly or somewhat agreed with this statement and 39% strongly or somewhat disagreed. There was also a small difference between male and female respondents, with more males, 44%, agreeing with the statement than females, 39%. Despite fairly positive attitudes toward marriage and relationships, a majority of young people, 56%, said forming a long term, healthy relationship will be harder for their generation than for previous generations. Talking to friends in person to receive information and advice about relationships was the highest picked option, with 72% of respondents saying they were somewhat are very likely to do so. Only 29% of respondents said they would be likely to talk to a school teacher or other adult. When limited to the option of choosing between talking to an adult, such as a teacher or parent, or searching for information and advice online, respondents favored talking to an adult. 44% said they would rather talk to an adult for advice, 33% said they would rather search for information and advice online, 11% said neither, and 10% don’t know. Regarding advice and information that can be accessed online, 42% of respondents said “there is not enough good relationship advice and information online for people my age,” 29% said there is enough advice and information online, and 28% said don’t know. Over 70% of respondents favored relationship education that helps them understand the characteristics of healthy relationships, how relationships can affect mental and physical health, and how to build long term relationships.